Perhaps if my very first exposure to an Amazing Spider-Man Annual was issue was ASM Annual #1, I wouldn’t have this very bizarre hang-up about considering them a part of my collection. During a conversation I once had with another blogger and comic book aficionado, this person referred to ASM Annual #1 as a “wonder of the world.” And I think in terms of the world of comic books, he’s spot on. There’s something grand and magical about this comic book. That doesn’t disregard some of its flaws – of which there are a few, primarily dealing with the plausibility of the story, the heavy handed cross promotion of other Marvel superhero books and some of Stan Lee and Steve Ditko’s odd character choices. But it’s hard to beat up on something that is so ambitious and engaging. It’s like being a wrestling fan and criticizing the “workrate” of Hulk Hogan vs. Andre the Giant at Wrestlemania III. You’re missing the point. At 72-pages, ASM Annual #1 is a giant, but it also works extra hard to get the consumer to read every single page. And if for some reason the reader doesn’t cooperate, they’re missing out on something great. 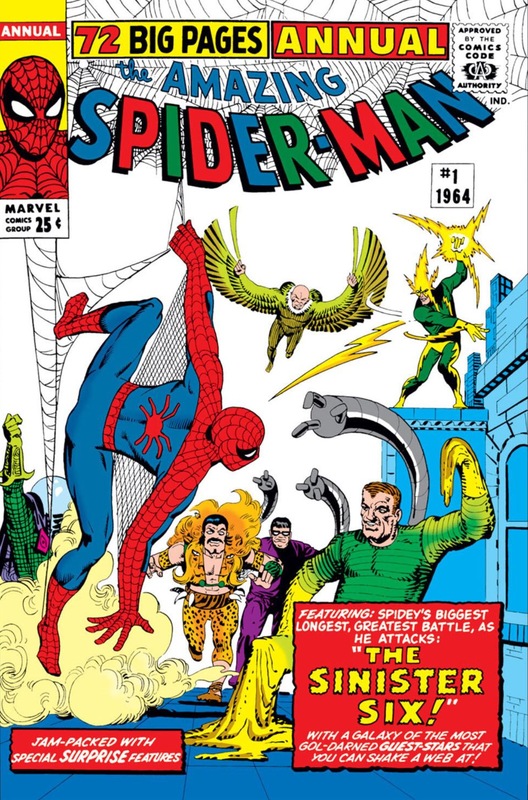 Beyond the awesome main story, which pits Spider-Man against his six deadliest foes (not counting the Green Goblin) – Doctor Octopus, Sandman, Vulture, Mysterio, Kraven and Electro – Lee and Ditko deliver pin-ups, a back-up story detailing Spider-Man’s powers, and a hysterical back-up to the back-up story about the “creative process” between Stan and Steve. 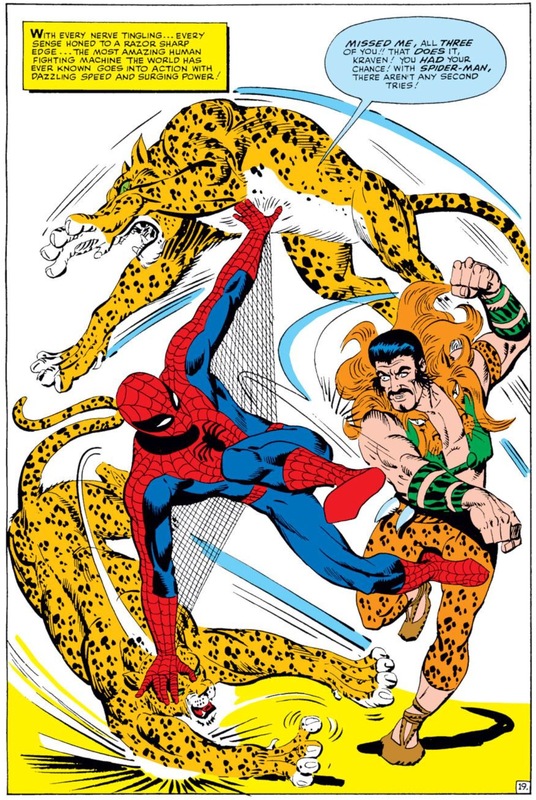 When people say things like “they don’t make comics like they used to,” they’re likely referring to ASM Annual #1. I’d argue with anyone that it provides more bang for the reader’s buck than any other comic book that came before or after. If you’re a fan of Spider-Man overcoming great odds, than Spidey vs. the Sinister Six is the story for you. It’s arguably one of his biggest triumphs, even if the outcome probably would have been vastly different if the group had just listened to Vulture in the beginning and decided to attack Spider-Man all at once, rather than one at a time (but that’s just how Doc Ock, the Master Planner, drew it up). What makes ASM Annual #1 such a compelling read is the way Lee and Ditko continually ratchet up the drama. 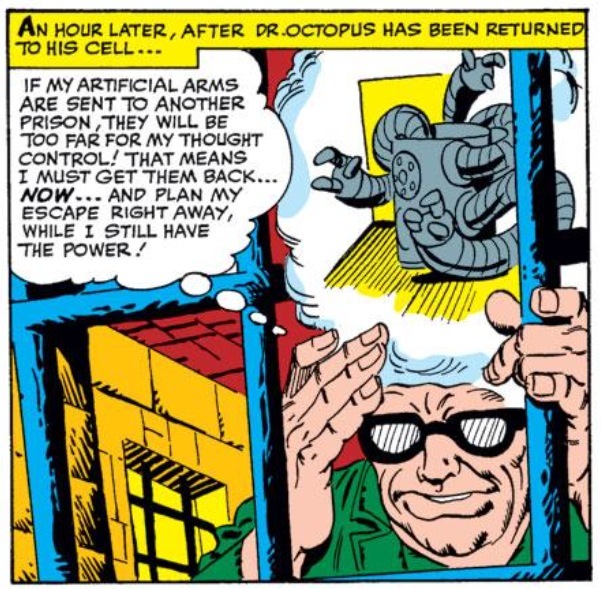 The comic opens with Doc Ock making his great escape from prison – by using a new found power of telepathy to bond with his mechanical arms. There’s the mysterious figure who turns out to be Sandman that Peter is trying to chase down, only to get distracted by Flash Thompson. Because of Flash, Sandman gets away, which ties into the bigger, overarching theme of the comic: this idea of Peter’s precarious balancing act between being Peter and being Spider-Man. Remember, this comic was released very early on in Spider-Man’s tenure, years before readers were fed a steady diet of stories where Peter was so “fed up” with his superhero alter ego that he’d quit altogether. This comic is driven on balance and timing. 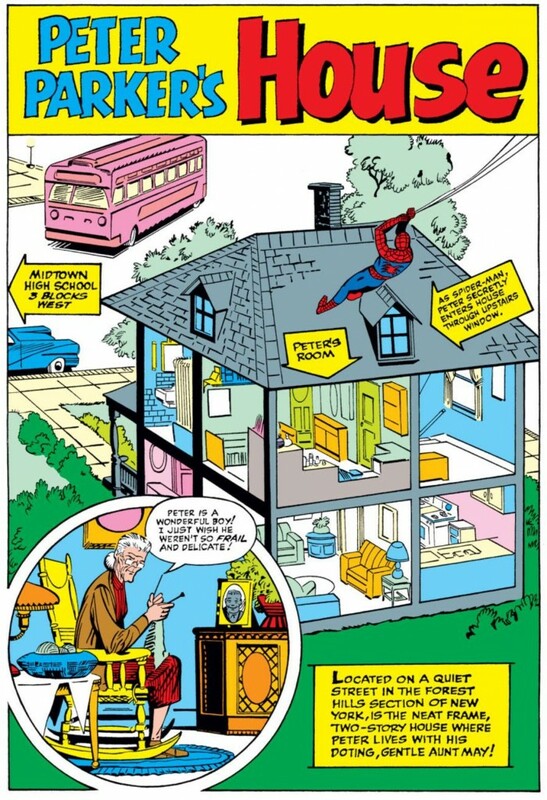 It is important in this story that after Peter fails to apprehend Sandman, he swings back to Aunt May’s house only to find her weeping in the attic while going through some of Uncle Ben’s old things. Peter is shocked that she still hasn’t moved on from his death a few months ago. A dejected Peter walks aimlessly along a number of New York City rooftops, before his powers abandon him. Coincidentally, that’s when the Sinister Six decide to strike. 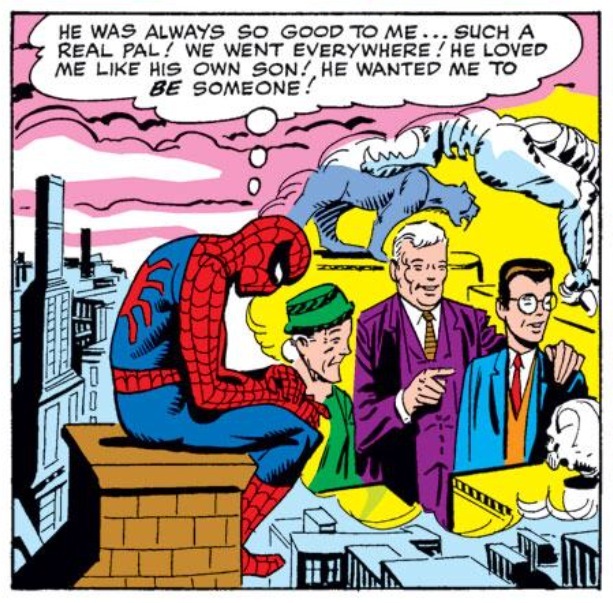 They kidnap Peter’s then-girlfriend Betty Brant since Doc Ock recognizes her from his last storyline in ASM #11-12 (in a nice nod to continuity). Aunt May has the bad luck of being at the scene of Betty’s abduction, and gets kidnapped as well (though in a running gag throughout this issue, May seems none the wiser about the villainous company she’s in and she keeps commenting on how well-mannered Doc Ock is). After Betty and May are kidnapped, Peter abandons all hope of giving up his life as Spider-Man, but he also has to come to grips with the idea that he has to save the two people who mean the most to him without his powers. 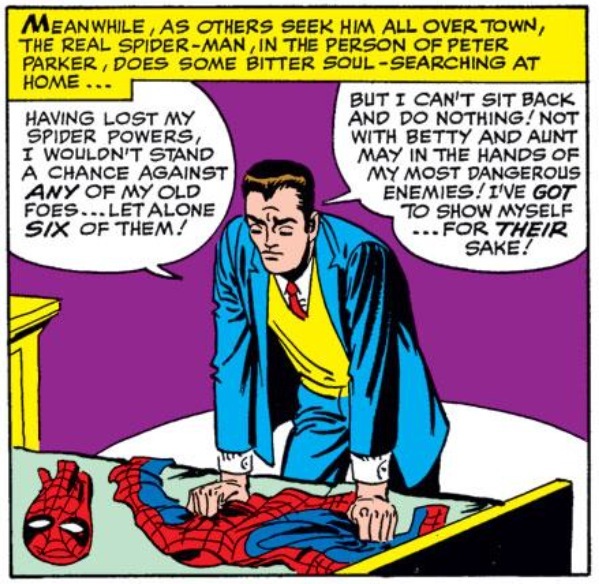 Peter’s “if this be my finish, at least I’ll face it like a man!” speech may be one of the greatest Spider-Man orations in the Lee/Ditko era. Of course, Spider-Man gets his powers back just in time for his battle with the first member of the Sinister Six, Electro. The power shortage is explained away as being “psychosomatic” which is a little bit of a stretch, but again, the flimsiness of the plot is easily overlooked with what comes next. For each battle with a Sinister Six member, Ditko completely cuts lose and delivers these beautiful splash pages that stand as some of the very best art he ever produced. I’ve long been a fan of Ditko’s splash pages, but even after knowing what’s about to come next in this comic, he manages to surprise and overwhelm me with these Sinister Six portraits. Up until this point, Spider-Man has never looked quite so dynamic, and while other artists would eventually surpass Ditko in terms of overall quality, there would be nothing for them to build on without artwork like these splash pages. 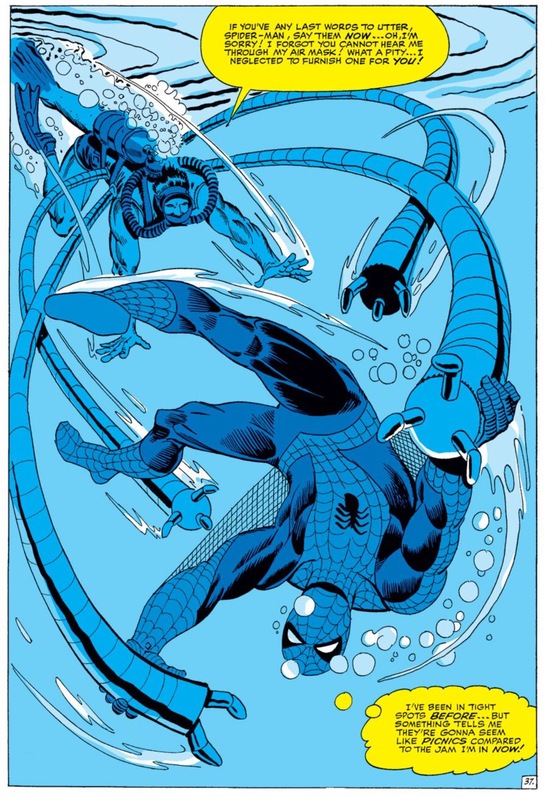 The Sinister Six storyline also manages to elevate Doctor Octopus as the true “top dog” in Spider-Man’s rogues gallery. Otto would naturally cement his status for the next decade with the “Master Planner Saga” a few years later, but even without that iconic story, Doc Ock as the ring leader of all of these villains demonstrates where he sits on the food chain. Additionally, the whole premise of his plan is true egomaniacal Otto: He has each of these villains attack Spidey one at a time at locations that play to their unique strengths, yet he doubts his colleagues just enough to make sure he’s personally the last line of defense so he can destroy Spider-Man himself. Though I’d argue there’s something just a wee bit silly about seeing SCUBA Otto in this comic book. Apologies if such a comment makes me sound ungrateful. But on that note, you can’t talk about ASM Annual #1 without mentioning how funny it is. 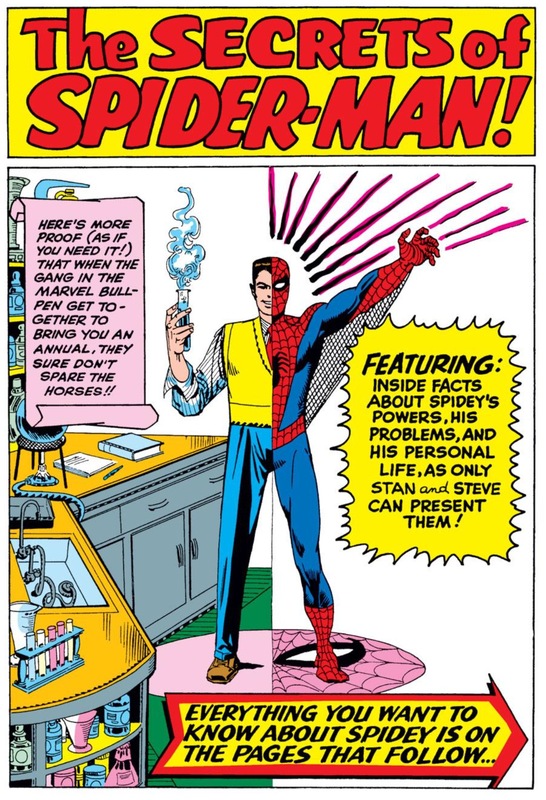 While Stan always gets the scripting credit for ASM, I can’t help but give the bulk of my props to Ditko and his very quirky sensibilities (I’ve long maintained that when there’s a scene that’s funny in an offbeat way, it’s a Ditko joke, while the cornier stuff is all Lee). In what other Spider-Man comic do you have J. Jonah Jameson talking to an actual spider in hopes that the arachnid will let him know where Spider-Man has run off to? The pinup pages and back-up stories that close out this comic are essentially whip cream and cherries on top of the sundae. And in case readers didn’t think they got enough value from this comic, not only are there pretty pictures to look at, but Stan and Steve go into a fair amount of detail explaining Spidey’s costume, his powers and his strength level (only the Hulk, Thor and Thing are stronger? Hmmm…). They even throw in a rendering of Peter Parker’s house. By popular demand, I guess? To go back to my original thought, ASM Annual #1 is such a marvelous comic book, I have to admit it does tweak me just the littlest bit that it’s not part of my collection. When I dismiss the “you need to count the annuals” debate, I always throw in the disclaimer that one day I do plan on buying all of those issues too, but in the interim, my focus remains on the core ASM series of which I am extraordinarily close (two issues) to completing. But if a well priced copy of ASM Annual #1 that’s in a condition I could accept fell into my lap tonight, I would absolutely buy it despite the fact that I’m still trying to finish out the main series. That’s how much reverence I have for this comic. It is a wonder of the world after all. Says you, sir. Ditko Spidey is tops in my book. I agree though that this issue is basically like a manual on how to draw Spidey. The bonus splash, “Spidey’s Living Action Demonstration,” is one of my favorite single pages in any comic ever. It’s weird to say, since after all he created the character, but Ditko right out of the gate understood how Spider-Man SHOULD look. There’s a vision at work in the way Ditko draws Spider-Man in motion. I don’t think any artist since has been able to capture the bizarre, unstable poses that made Ditko’s Spidey seem like he was constantly twisting and flipping around inside the static panel. This is not to detract from other artists, who often had great strengths in other arenas, but for me Ditko has it locked as far as the actual figure-drawing of Spider-Man goes. Haha, didn’t mean to get a rise out of you Cass. Ditko “created” Spider-Man, no doubt, but Romita will always and forever (and ever and ever) be my fave Spidey artist. 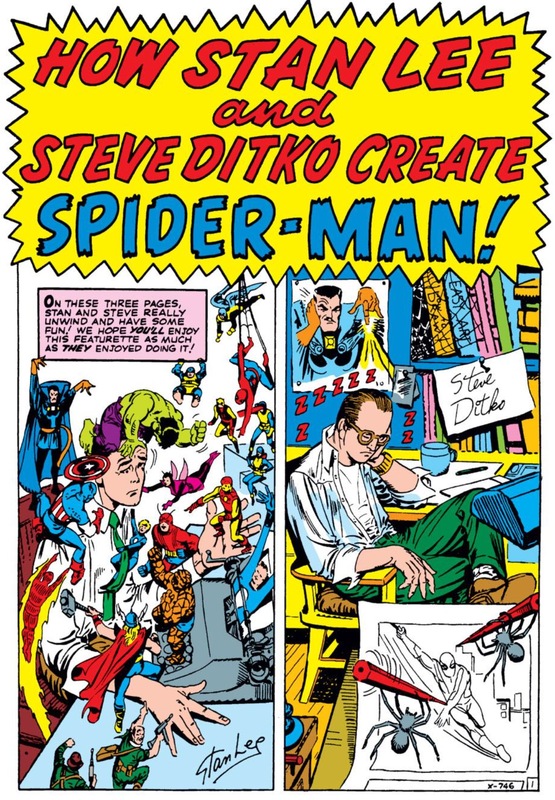 I would never argue with anyone who claims Ditko is the best, but the heart wants what the heart wants!